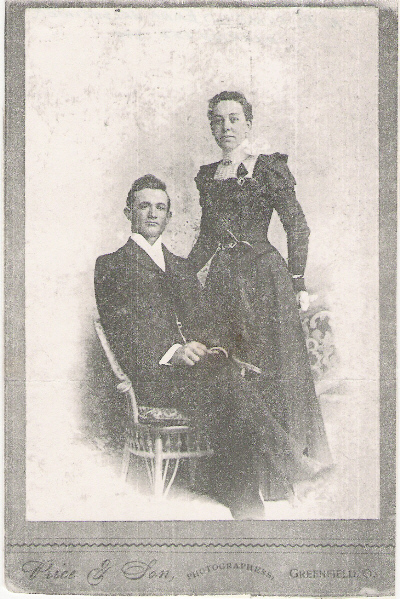 Noble Harrison Limes & Emma Welsheimer were married on February 15, 1899 in Greenfield, Highland County, Ohio. Noble Harrison "Harry" Limes was born on November 21, 1870 in Trenton, Missouri to William Limes II and Savilla Jane Beals (aka Bales). Emma Welsheimer, the daughter of Samuel Welsheimer and Martha Bush, was born on August 22, 1868. "Harry" and Emma were buried at the Cochran Cemetery in Fayette County, Ohio. Their children were Lois Leona Limes, Martha Jane Limes and Dr. William Limes. Dr. William (Bill) Limes, who resided in Washington Court House, died April 10, 1987 and was buried in the Sabina Cemetery in Clinton County, Ohio. This scanned photograph, courtesy of Linda Jean (Limes) Ellis, 18 April 2005, was received by Linda from Dr. Bill Limes.